April 14, 2015 – An 18-foot-wide, 10,000-plus-pound cryogenic tank for NASA’s new rocket, the Space Launch System (SLS), traveled by road and by river March 12 from NASA’s Marshall Space Flight Center in Huntsville, Alabama, to a Dynetics Inc. test facility in Iuka, Mississippi. SLS will be the most powerful rocket ever built for deep space missions, including to an asteroid and ultimately to Mars. The first flight test of the SLS will feature a configuration for a 70-metric-ton (77-ton) lift capacity and carry an uncrewed Orion spacecraft beyond low-Earth orbit to test the performance of the integrated system. NASA plans to evolve SLS to provide an unprecedented lift capability of 130 metric tons (143 tons) to enable missions even farther into our solar system. To do that, the SLS will require an advanced booster with more thrust than any existing U.S. liquid- or solid-fueled boosters. Huntsville-based Dynetics is one of four companies contracted under a NASA Research Announcement to develop technologies to improve the affordability, reliability and performance of an advanced booster for a future version of the SLS. These initiatives are examining advanced booster concepts with risk-reduction activities and hardware demonstrations. The cryogenic tank is part of that work, and it was assembled using friction-stir-welding tools at the Marshall Center, which manages the SLS Program for the agency. Friction stir welding uses frictional heating combined with forging pressure to produce high-strength bonds virtually free of defects. The welding process transforms metals from a solid state into a “plastic-like” state, and uses a rotating pin tool to soften, stir and forge a bond between two metal plates to form a uniform welded joint — a vital requirement of next-generation space hardware. 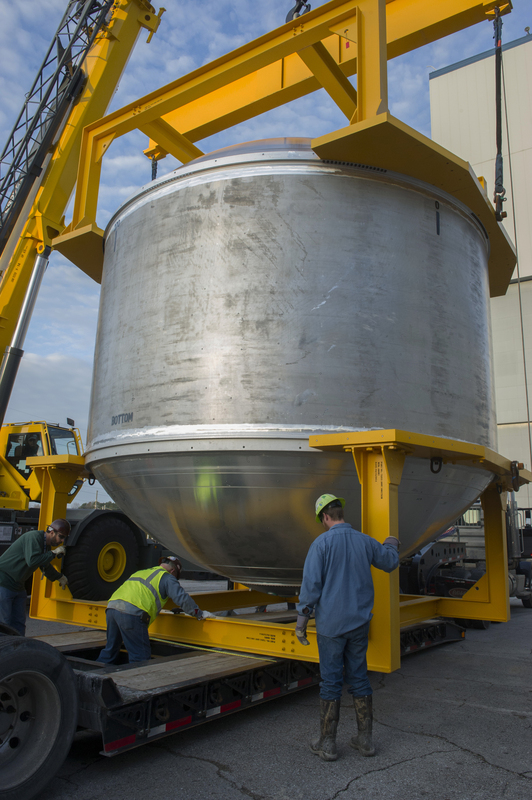 The tank will be tested at the Iuka facility in late April to verify that its structural design and manufacturing processes meet all NASA requirements. The testing will include hydrostatic proof and cryothermal testing with liquid nitrogen, which will simulate liquid oxygen conditions. In addition to Dynetics, three other companies were awarded contracts to develop technologies for potential application to SLS advanced booster concepts: Orbital ATK of Dulles, Virginia; Aerojet Rocketdyne of Sacramento, California; and Northrop Grumman Corp. Aerospace Systems of Redondo Beach, California.